NASHVILLE — A powerful surge in construction is reshaping the physical character and economy of this 236-year-old river city, and fueling a deepening public conversation about essential civic values that many residents worry could be lost. These include a 30-story, $220 million office building under construction on Fourth Avenue that will serve as the new headquarters of Bridgestone Americas, the United States division of Bridgestone, the world’s largest tire and rubber company. Under construction nearby is 222 Second Avenue S, a 25-story, $100 million, 350,000-square-foot building with 25,000 square feet of retail space. So many construction cranes are operating in downtown Nashville that they appear on the skyline as a flock of big birds, their extended beaks tugging at steel cables. A 454-room, 27-story, $120 million Westin is one of the high-rise hotels under construction. Just beyond downtown is OneCity, a $400 million mixed use project under construction that encompasses a million square feet of office space, 120,000 square feet of retail space, a 170-room hotel and up to 600 apartments. Even Music Row, the renowned neighborhood of recording studios and understated 20th-century music industry office buildings, has been affected. At the center of the temperate enclave, which once was set apart from the escalating construction clamor, is a 96,000-square-foot, five-story, $31 million office building nearing completion that will serve music production companies and talent representatives, including Sesac, a performing rights group that is moving from its old headquarters a block away. Never has this southern city of 660,000 residents experienced such a swarm of new projects, said Richard C. Bernhardt, who recently retired as director of the city’s planning department. The city, which spent all of the 20th century spreading out horizontally in low-rise apartment, retail, hotel and office buildings, is now going vertical. Nashville’s disparate, uneven skyline, highlighted by the twin spires of AT&T’s 33-story, 617-foot-tall “Batman” building, which was finished in 1994, is about to add enough height, complexity and sharp angles to rival downtown Charlotte or Denver. The shift in urban design responds to Nashville’s consistent attractiveness as a place to live and work, especially to young professionals and musicians, and to the millennial generation’s allegiance to active, walkable urban neighborhoods, Mr. Bernhardt said. Nashville has grown by an average of 11,000 residents annually this decade, more than three times the average annual growth during the last decade. Another significant step the city took was to invest in public parks. An 11-acre riverfront park opened this year to tie Nashville more closely to the Cumberland River. And Centennial Park, Nashville’s 112-year-old central park, is undergoing an extensive renovation to restore its broad lawns, walking paths and gardens. Nashville’s unleashed growth, though, has stirred civic concerns about how to solve the region’s swelling traffic problem, and about the city’s identity. City leaders and many residents agree that Nashville is in dire need of an improved transit system. Mayor Megan Barry, who took office in late September, campaigned on a platform that included promoting more bus and rail options. The transition to a city with livelier street life and much taller buildings has also unnerved some residents and spurred a discussion about Nashville’s distinctive way of life. Still, in a departure from the polemical debates about growth in other American cities, which typically involve either unleashing developers or putting up high barriers of civic opposition, Nashville’s pursuit of a much denser urban experience is being undertaken with a kind of pragmatic wariness. That approach worked for Bridgestone Americas, which settled in Nashville in 1992 and now employs 1,100 people in a leased office tower near the airport. Facing the expiration of its lease in 2017, the company began a national search in 2012 for new space that could have led to Bridgestone’s leaving Nashville. By November 2014, when Bridgestone announced that it would lease an angular glass and steel tower developed by the Raleigh-based Highwoods Properties, Nashville’s downtown makeover was well underway. In 2013, Nashville opened Music City Center, its $623 million, 1.2 million-square-foot convention center on Fifth Avenue. Nearby, in April, the city opened a new 8,500-seat, $47 million baseball stadium for the Nashville Sounds, the AAA affiliate of the Oakland Athletics. 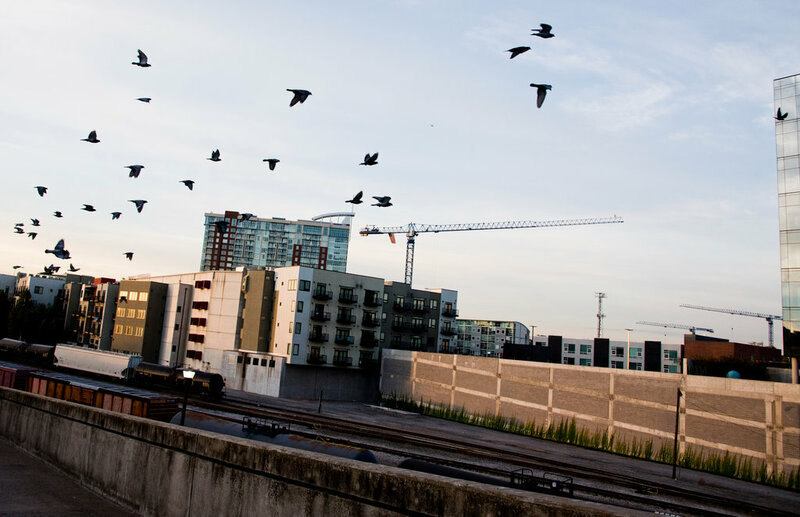 To some extent, Nashville can thank the commercial and cultural success of The Gulch, once a 60-acre stretch of vacant parcels and light industrial buildings along the CSX rail yard downtown that MarketStreet Enterprises, a local developer, turned into one of the city’s most active neighborhoods. The company started the project in 1999 with land purchases. In 2001, the city approved its master development plan. In 2008, MarketStreet Enterprises completed the 22-story Icon in the Gulch, a 418-unit residential building that included space for retail businesses and restaurants. Similar high-rise residential buildings followed, which provided the customer base for the new neighborhood’s trendy retail businesses and popular restaurants. The project’s newest phase is office construction. In May, MarketStreet Enterprises opened Gulch Crossing, an eight-story, 205,000-square-foot, $78.5 million office building with 16,000 square feet of street-level retail space. A few blocks away, Eakin Partners is building a 15-story, 285,000-square-foot, $95 million office tower with 26,000 square feet of retail space. MarketStreet Enterprises, which estimates that it has built 70 percent of the Gulch, also has a joint venture with AJ Capital Partners and the Berger Company to construct a 12-story, 224-room Thompson Nashville Hotel in the Gulch.